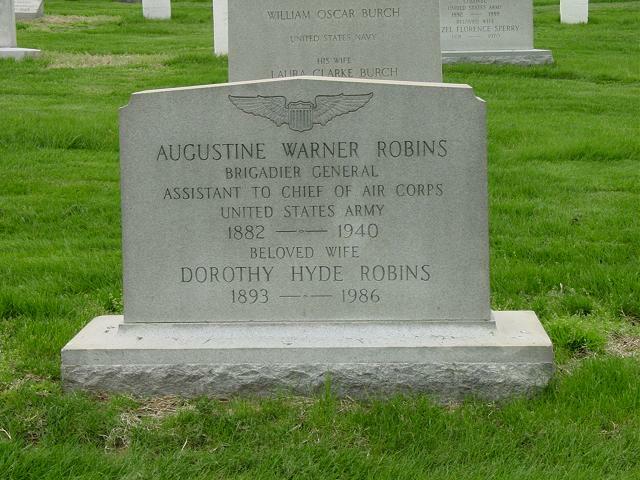 On 16 June 1940, Brigadier General Augustine Warner Robins, whose name the City, Base, and Center proudly bear, died at Randolph Field, Texas, of a heart attack. Serving under his permanent rank of Colonel, he was commander of the Randolph Field Flying School from March 1939 until his death. He had previously served as commander of AFMC's ancestor, Materiel Division. Son of the dashing Confederate Civil War hero, Colonel William Todd Robins and the famous suffragette and writer Sally Nelson Robins, Robins was indirectly related to President George Washington and General Robert E. Lee. The great, great grandson of Virginia's Revolutionary War Governor and hero of Yorktown, Thomas Nelson, Robins was a true son of Old Virginia. On 20 June, he was buried with full military honors at Arlington National Cemetery. Nearly a year after his death, on 14 June 1941, The War Department, following a long and competitive search for the site of a new air depot in the southeast, selected Wellston, Georgia, with a population of about 300 as the site for the construction of an Air Corps depot. Two days later, Macon leaders received an official telegram from U.S. Congressman Carl Vinson (D-Georgia) formally announcing the War Department's decision. In an action that would have far reaching effects on the future of Robins Field, on 20 June 1941, War Department officials formally established the Army Air Forces (AAF) as an autonomous command within the U.S. Army. The new Army Air Force was comprised of the Office of the Chief of the Air Corps and the Air Force Combat Command (formerly GHQ Air Force). Major General Henry H. Arnold was made Chief of the Army Air Forces and reported directly to the Army Chief of Staff. Just over a year later, on 30 June 1942, workers officially completed the original depot construction job as well as the construction of the cantonment area for what was still known as the Wellston Air Depot (WAD), Robins Field. This was at a critical time during World War II. There has always been a dearth of sound biographies of American airmen involved with engineering or logistics matters. William Head, an official historian with the Air Force, helps fill this void with a biography of Warner Robins, perhaps the first and most important of the air logisticians: Every Inch a Soldier: Augustine Warner Robins and the Building of U.S. Airpower. (College Station: Texas A&M University Press, 1995). Robins was born in 1882 to a patrician Virginia family whose men had fought in the Revolution, the War of 1812, and the Civil War. Following in such footsteps, he entered West Point in 1904, the same class as "Hap" Arnold. After graduation in 1907, Robins spent a decade in the cavalry, and in 1916 his troop accompanied General John Pershing to New Mexico for the "punitive expedition" against Pancho Villa. The famous Mexican bandit escaped, but Robins did not. One of the other units on the border was the 1st Aero Squadron, a group of flimsy airplanes engaged in reconnaissance operations. Robins was intrigued by the possibilities of flight and submitted his papers for a transfer to the air arm. Because of his relatively senior rank he was a major by that point Robins was put into an administrative position almost as soon as he won his wings. Although thereby missing the chance to serve in France, Robins made a reputation as a first rate organizer. In 1919 he was assigned to the Supply Division of the Air Service, and in a sense, he never really left. For the next twenty years Warner Robins would toil in the world of logistics, mostly at Wright Field in Ohio. These were crucial, if not glamorous, assignments that put him in the forefront of technological development. Airpower was only a word unless the planes were developed and built to carry out the theories of the air advocates. Combined with this need, however, was the contradictory requirement to cut spending for defense in a period of fiscal conservatism heightened by the Great Depression. It was a tremendous challenge for an airman in Robins's position. Head tells us that Robins was an outstanding logistician who was largely responsible for putting the Air Service, and later the Air Corps, on a sound administrative footing. He instituted a supply accountability system that remained in effect until the advent of computers thirty years later. Likewise, in 1927 he moved to open a logistics school for nonflying officers in the future it would be unnecessary to rely upon officers transferred from the cavalry! Missing from this account is detail on how precisely Robins went about his task and how his ideas differed from standard practice. Clearly, however, the author's conclusion regarding his subject's impact is accurate; a series of air chiefs found his work indispensable. As the air arm expanded between the wars and its materiel functions became more complex, Robins advanced in rank to assume greater responsibilities over these efforts. In 1935 he was promoted to brigadier gener alone of only four in the Air Corps at the time and given command of the Materiel Division at Wright Field. For the next four years Robins oversaw the entire logistics side of the Air Corps. He pushed hard for increased funding for research and development, as well as key technologies ranging from the B17, to the Borden bombsight, to the high octane gasoline needed to power the new high performance engines. More importantly, he was in charge of the logistics end of the air arm just as the country began its massive expansion for World War II. An indifferent pilot, Robins suffered a nearfatal crash in 1921 that broke his jaw and right arm. The following year he also developed hypertension severe high blood pressure. Each year thereafter it became a chore to pass his physical and in some cases it was necessary for him to check into the hospital for two weeks prior to the exam so his condition could be brought under control just enough to get a clean bill of health. In 1939 he took over the Air Training Command in Texas, but in June the following year the stress of approaching war combined with his parlous health resulted in a fatal heart attack. He was 57. Three years later the Warner Robins Army Air Depot at Robins Field, Georgia, was dedicated to his honor. Head has written and enjoyable and heavily researched account of an important airman. Logistics is not an overly exciting subject, but it remains absolutely essential to military operations. As the old adage goes, "amateurs discuss strategy, but professionals talk about logistics." Warner Robins played a key role in establishing the foundations for Air Force logistics that would stand the test of war and the transition to the independent service that followed. SAN ANTONIO, Texas, June 16, 1940 – Colonel Augustine W. Robins, commanding officer of the Air Corps Training Center, Randolph Field, died today of a heart attack. Lieutenant Colonel Fabian L. Pratt of the Medical Corps was called early today and found Colonel Robins in a coma. Colonel Robins died without regaining consciousness. A funeral service will be conducted at the Randolph Field post chapel at 2 P.M. tomorrow. Burial will be in Arlington National Cemetery in Washington at 2 P.M. Thursday. An Army officer since his graduation at West Point in 1907, Colonel Robins, who was 57 years old, spent his first ten years with the cavalry and had attained the rank of Major when transferred in 1917 to the Air Corps, with which he remained thereafter. 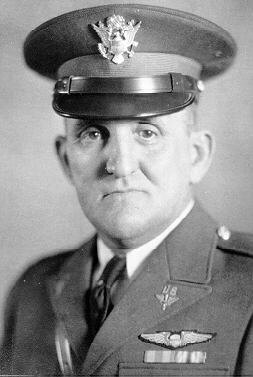 Early in 1935 he was appointed Assistant Chief of the Army Air Service and he held that post for four years, at the same time having command of the material division air corps at Wright Field, Dayton, Ohio. In March 1939 he was made commanding officer of the training center at Randolph Field. Colonel Robins was born in Gloucester County, Virginia, September 18, 1882, a son of Colonel William Todd Robin and a descendant of a Revolutionary officer. His military education, in addition to West Point, included courses at the Mounted Service School, Air Corps Tactical School, Army Industrial College and the Army War College. He belonged to the Order of the Cincinnati, the Masons, the Army and Navy, and the Army and Navy Country Clubs, Washington, C.
In 1915 Colonel Robins married Gretchen Hyde of Saginaw, Michigan. Three daughters were born to them. This information is taken from St. George’s official burial register. It is provided for the convenience of those doing genealogical research or otherwise searching for deceased family members.